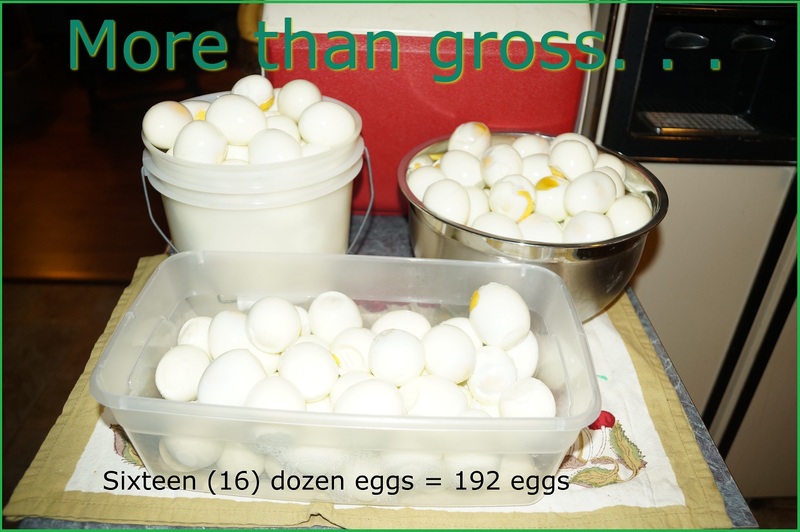 Yesterday I dealt with gross eggs. Actually more than gross. Yes, there you have it…. 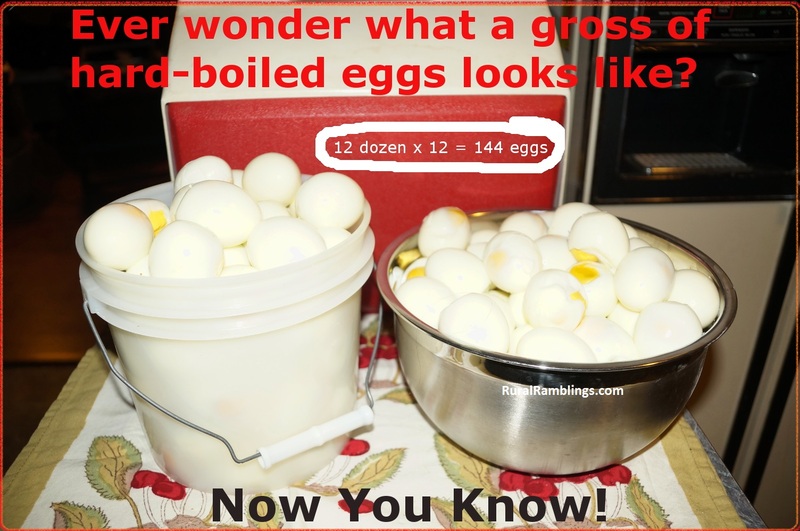 a gross of hard-boiled eggs! But wait! I said “actually more than gross” didn’t I??? Well, that’s because I actually dealt with 16 dozen, yes, I said SIXTEEN dozen hard-boiled eggs! 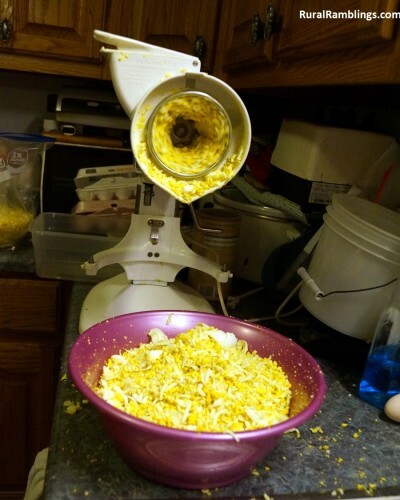 That’s right folks, I hard-boiled 16 dozen eggs, peeled them, and then I shredded them. And just so you know, here’s what 16 dozen shredded eggs looks like when packaged up in Hefty 2.5 gallon bags (14 3/8 in. x 16 in.) . 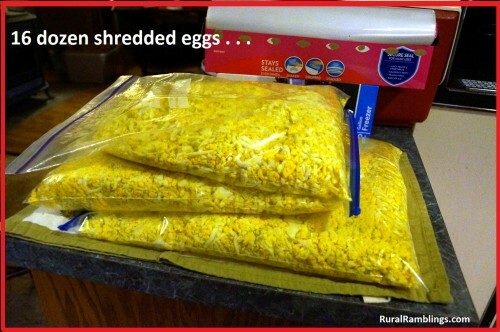 . .
For your further edification, you might like to know that those 3 bags contain 24-pounds of eggs. Now perhaps you are wondering why in the world I hard-boiled and shredded so many eggs. Well, here’s my true confession. . .
At the moment, we have 14 laying hens running around outside. Generally speaking, they all lay one egg every day. We cannot eat over a dozen eggs daily. So I started giving eggs away. But not fast enough. I would give away the freshest eggs, and that left cartons and cartons of eggs stacked in the refrigerator growing older and older. Yesterday I decided enough was enough, and I was going to start over. I was sorely tempted to just toss all those eggs into the woods and let the wild critters eat them. But I figured that’s a bad idea to get them used to eating our hen’s eggs. And I couldn’t bring myself to waste that many eggs. 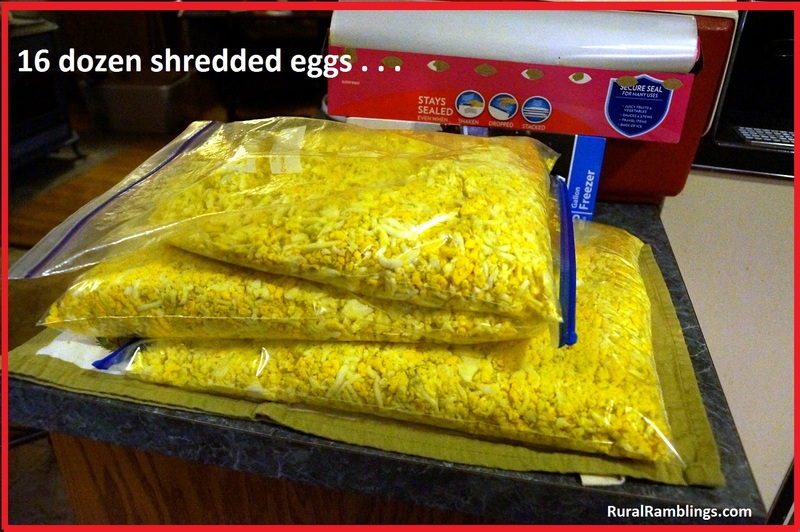 Now all those old, shredded eggs reside in the freezer, to be pulled out in batches to mix with dog food. Hey, that’s not wasting them. We have to pay for dog food, right? And since I wasn’t sure the eggs were fit for human consumption, but not slimy-spoiled either… I figured they’d make good dog food. And that’s how I got into my latest eggscapade, dealing with more than gross eggs.